Adds additional options to toggle/show/hide helmet. Will this addon be changed to work with the new method currently on PTS to hide the helmet, aka 'hide helm' from within HATS section collectibles section? Better news: (Un)equiping the helmet does not sheath weapons, so that can be a workaround. Working on it. Well, I kinda got it working, but there's much more that can go wrong (e.g. finding the correct item to equip). It's pretty much useless anyway, because you can't (un)equip items when in combat so the auto mode doesn't work with it but that's where we actually need the toggling without sheathing the weapons the most. Sadly it constantly sheathe your weapon with helmet toggle - this is annoying as hell. And lowering DPS. Jap, just reproduced it, that's strange. I'll look into it. I'll still try to tinker with it and will update the addon if I find a solution, but it looks like we're S.O.L. Last edited by CaptainBlagbird : 06/07/17 at 02:33 PM. Last edited by CaptainBlagbird : 06/07/17 at 02:09 PM. the keybind turns of the auto toggle :? Yes, that behaviour is intended. The key, button and chat command are for the manual mode, and the combat detection is the auto mode. is there no way of having both? ive been RP'ing alot lately so i put on and remove the hat alot but its odd that it only disables the hat , i have to manually got into te addon again to enable it. its great non the less but thats just my lil wish. Would you have any interest in making a toggle for 'Prevent Attacking Innocents' via a keybind? Last edited by CaptainBlagbird : 03/27/16 at 12:19 PM. Found a weird bug with the "Display UI Toggle" feature when turned off. Upon logging in or reloading the UI, the button is shown at all times (cursor or no cursor) until manually turned on+off again. Otherwise, it seems to work fine. Thanks for reporting, fixed it. The UI is now really only shown when enabled and cursor+compass visible (but not in loot menu). 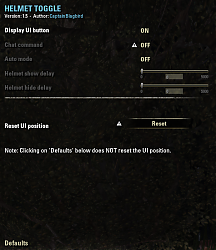 Upon logging in or reloading the UI this really only is the case when ESO is the inactive windows (e.g. Windows Explorer has focus, don't know about Mac though).